Sometimes an orange and a shiny shilling just won’t do. It‘s time to get original – check out our shortlist of alternative stocking fillers for all members of the family. How many times has mum, auntie or granny received smellies? Well its time to be original. Eschew the packaged soaps and hand lotions – they are probably still using the ones you got them last year! Head to a local beauty salon and get them a voucher for a treatment. Mini manicures are often the same price as these smellies but are more of a pampering treat for the ladies, or perhaps men, of the family and we guarantee that they will appreciate the gesture! Just as mum gets smellies, dad gets socks. Give him a break from the norm this year and replace those socks with something different. A great alternative could be another clothing accessory: a wool or cashmere scarf, a new leather belt from his favourite shop or a pair of quality leather gloves. Opera fans, R&B obsessives or garage loving relatives will love a CD from their favourite genre. Ask them directly what they want or keep the mystery and head to a specialist shop and get the lowdown from an expert in the field. If all else fails, a voucher from an online download store of high street music shop will be a winning gift idea. By all means continue tradition and give each family member an orange for Christmas. However if you happen to know that your brother or sister is passionate about dark chocolate, seek out a bar of the finest, highest cocoa content bars. 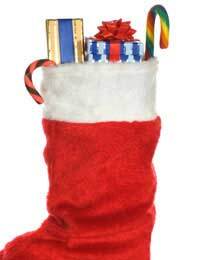 For children, buy bumper packs of their favourite sweets and stuff them into the stocking. Candles are one of those non-offensive gifts that are often appreciated by both sexes. They are a safe bet and these days you can pick up some incredible scented versions. Jo Malone and Miller Harris candles will be appreciated by anyone. Their gorgeous fragrances pervade homes and they are a truly quality gift. Cheaper and well-packaged alternatives are also available on the high street and will be similarly appreciated by anyone who receives them. Lingerie is sometimes seen as a risky option. It’s all too easy to get the cup size wrong or select a style that might be seen as slightly racy or unwearable. Don’t fear! If you are really not sure get them a voucher from a premium lingerie brand so that the receiver can make the final decision. Alternatively go for black. It’s safe, wearable and won’t be misinterpreted. Do your research beforehand to ensure that you are not making any sizing mistakes. Christmas is a special occasion and it might be a good opportunity to show your loved one how much you care for them. Diamonds are always welcome and it would be extremely difficult to get wrong. However, such a safe bet often comes with a hefty price tag. If you need to reign in the expense, head to his or her favourite jewelers shop and get something small that you know they will appreciate. Even the most famous jeweler houses have wide selections for budgets under £100. Has your teenage son or daughter dreamt about DJ lessons? Has your little girl or boy always wanted to go horse riding? Whoever has the dream; Christmas is the time to make it happen. Get a voucher or a gift certificate for that course or day trip that they have always wanted to happen and surprise them on Christmas Day. There are no rules when it comes to stocking fillers. You can make them as extravagant and as indulgent as you like. Or you can keep them traditional and make the presents symbolic and less materialistic. The choice is yours. Don’t worry about budget. Thought is more important. When the receiver of the stocking sees the planning and effort that has gone into the presents they will be truly thankful.